Is is feeling like Autumn yet where you live? Well we got a big dose of it here this weekend. It was chilly, and the leaves are starting to change. So in the spirit of Halloween and Autumn, today I have a cute, and not so scary, witch hat project for you to complete. I actually worked on this project at a recent family craft night, we had so much fun! Here are the supplies that you will need. The first step is to paint your witches hat. We used black paint from Plaster Paints, but you can use any black paint that you have. While the black paint is drying you can plan out your embellishments. I used some fringed crepe paper that I found at Target to line the base of the hat. Then I decided it would be fun to add some polka dots to the hat, so I got out the orange paint, and dotted the hat! Here is the one my aunt made for my Granny. I think she loves it! This is a great project to get a group of friends together and get creative! I placed my hat on my Halloween mantel, on a stack of vintage books. I like the way it turned out. You can see my completed Halloween mantel here. 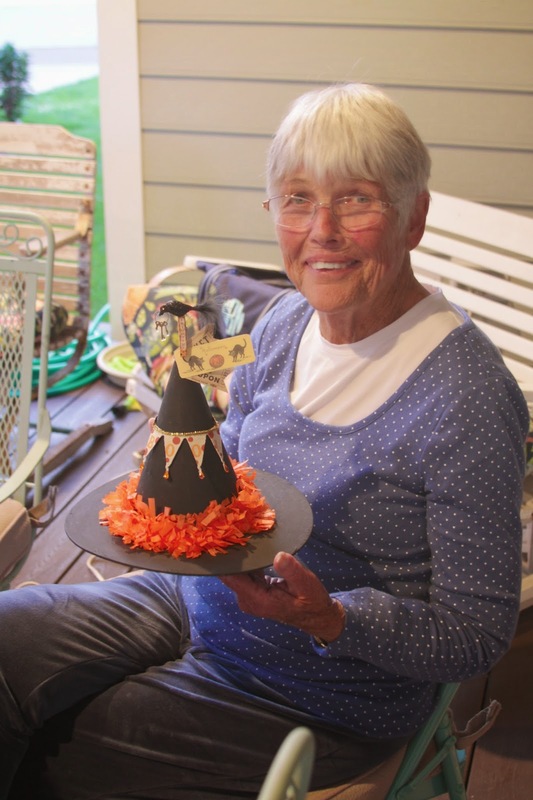 Hope you feel inspired to make a witch hat for your Halloween decorations!